Are you on the hunt for a remote control boat for your child? If so, you will have already seen that there are quite a few options available which can be overwhelming. That’s why we’ve put together this review to help you learn more about the best options so that you can find the one that your child will enjoy the most. A buying guide section is also available at the end which provides you with even more valuable information. This RC Boat for Pools and Lakes enables kids to take it at high speeds of up to 20 mph! Therefore, you can be sure that they’ll have a blast playing with it for a while. We liked how they’ve implemented a faster brushless motor as well as letting kids race their RC boats. The 4-channel system can be used without any interference which allows you to get multiple boats out on the water. We liked how the boat is able to recover itself if it ever capsizes. This makes it easier to kids to use if they’re beginners. Furthermore, it has been made out of high-quality materials that ensures it will remain durable for a long time. An extra battery is included which is great for keeping as a back-up to use as a replacement. We liked how this one is able to recover after capsizing as it’s a great way for kids to get a better grasp on the controls. This ability also makes it great to pair with an RC submarine that a sibling or friend may have since the sub could come up from underneath causing the boat to capsize. The INTEY RC Boat features a magnetic driving motor that has a cooling feature that keeps it more durable. This motor is able to power the boat toy to travel at speeds of up to 15 mph, which is plenty for kids to have fun with. Due to the 2.4 G technology, you can be standing up to 150 meters away and still be able to control the boat. We liked how they’ve used high grade ABS plastic materials to construct this one as it keeps it durable. In addition to this, there’s an awesome waterproof design that keeps the interior working for a long time to come. We were also impressed with how there’s an anti-tilt hull which ensures that the boat is able to recover if it ever capsizes. The remote control also lets you know when it’s running low in voltage. Kids are able to be up to 150 meters away from the boat and still have complete control over it, which is awesome when it comes to races on lakes. This RC Boat Pool Toy has been fitted with a 390 motor drive system which enables the toy to travel at speeds of over 20 mph. This is a lot of speed for children to play with which is super exciting. We liked how they’ve included a capsize recovery feature. This is very easy for kids to use and ensures that they’re able to get their boat back out on the water without any hassle. There’s also an LCD display available which provides you with information on the voltage level. The controller has a frequency for 2.4Ghz, which means you can get multiple boats out on the water to race. This can make it a more fun group experience, which is always good for your child’s social skills. 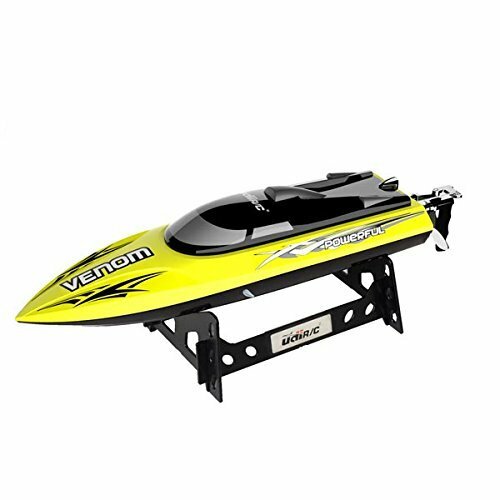 With speeds of over 20 mph and the ability to get multiple boats out at the same time, your child will have a blast playing with this one for a while. 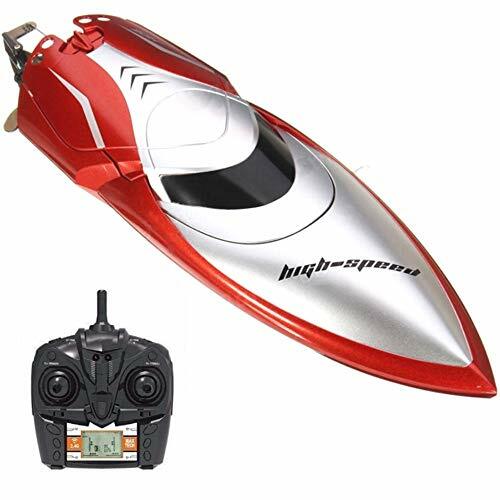 This HighSound Remote Control Boat comes with an anti-flip feature that work effectively to prevent it from capsizing. As a result, kids who are beginners are able to get to grips with the controls easier. It can travel at speeds of up to 18 mph, which is plenty to keep kids entertained for a while. We liked how they’ve used a streamline design as it works well to minimize drag and allow for better steering. High-quality ABS plastic materials have been used to construct this one, which makes it incredibly durable. In addition to this, it’s also waterproof. You can be standing up to 90 yards away and still have total control, while also being able to race multiple boats at once. The streamline design that’s available with this one makes it able to travel at fast speeds without capsizing due to the anti-flip feature. 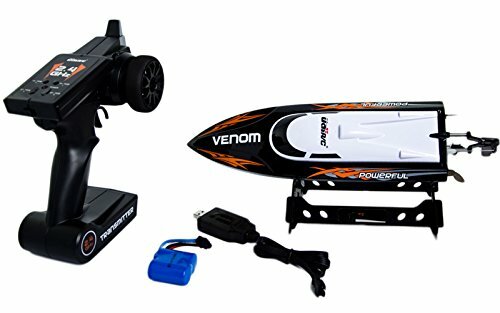 This Venom Remote Control Boat is able to travel at speeds of over 15 mph, which is a lot to keep kids engaged and having fun for a long time. The materials that have been used to construct it are of a high standard, which means you can feel confident in knowing that it will last for a while. The controls are also easy for children to use. Therefore, this is a great option for beginners. We also liked how the motor that powers the boat is water-cooled to ensure it’s durability. Due to the anti-tilt hull, the boat is able to recover if it ever capsizes. This is another fantastic feature that makes it idea for beginners. The easy-to-use controls and anti-flip feature make this one a great option for kids who are beginners. 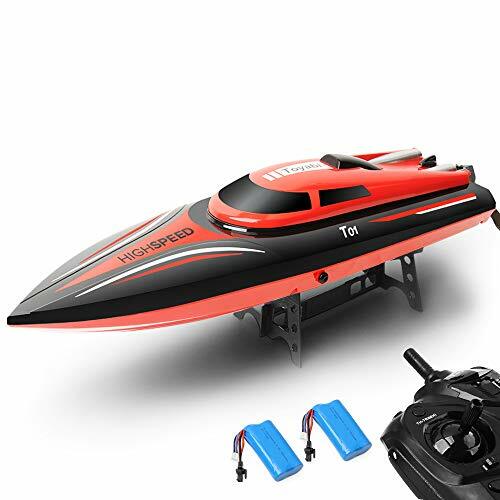 The TR Remote Control Boat is powered by a powerful brushless motor that features a water cooling system to ensure that it remains durable. This motor is able to power the boat to reach impressive speeds of up to 30 mph. This is a lot of speed for kids to play with, which makes it incredibly exciting. We also liked how the boat has a certain flexibility to it. This is one of the other factors that contributes to it’s high speeds. These high speeds that are available make the boat a lot of fun to use in races. You can be standing up to 300 feet away from the boat and still have total control too. The top speeds of 30 mph ensure that your kids can have a blast and use it to race against other RC boats. 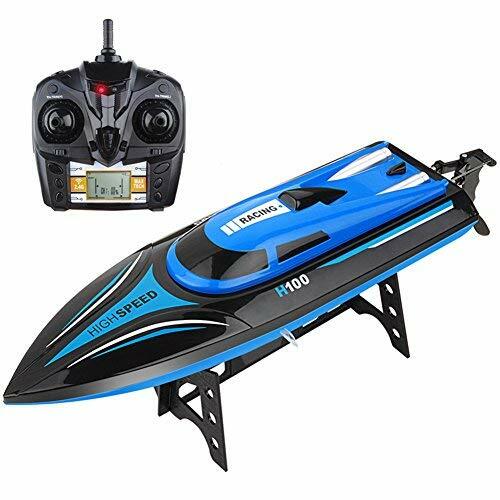 The Top Race Remote Control Water Speed Boat comes with a hull that has a waterproof design that works effectively to keep the boat durable. We were also impressed with how they’ve implemented high-quality ABS plastic parts as it provides the boat with even more durability. This one is a great choice for beginners as a result of the anti-tilt modular design. As a result, the boat is able to avoid capsizing, which makes it easier for beginners to get to grips with the controls. The 4-channel remote control allows kids to move the boat backwards, forwards, left, and right. It’s also able to take sharp turns with precision and without tipping over. With a top speed of 8 mph, we recommend this one for younger kids as it lets them have total control without an overwhelming amount of speed available. We like how kids are able to use the control to turn this boat sharply without it tipping over. The 8 mph top speeds also gives beginners a good amount of speed to play with. 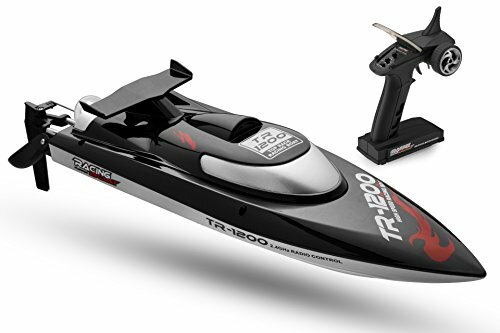 This TR-900 Remote Control Speed Boat features a powerful brushless motor that has a water cooling feature. It works effectively to prevent the motor from overheating, which keeps it more durable. The motor is able to power the boat to reach top speeds of over 12 mph. This is plenty for kids to have a blast with .We were also impressed with how sleek and flexible the design is. As a result, the boat is able to travel across the water without any issues. In addition to this, it has a split cat hull feature. This works effectively to allow the boat to travel at high speeds without capsizing. So, it’s an awesome option for beginners who are still learning how to use the controls. You can also be standing up to 200 feet away from the boat and still have complete control. Kids have been loving how they can race this boat across the water with great speeds, without it capsizing. It’s excellent for beginners! 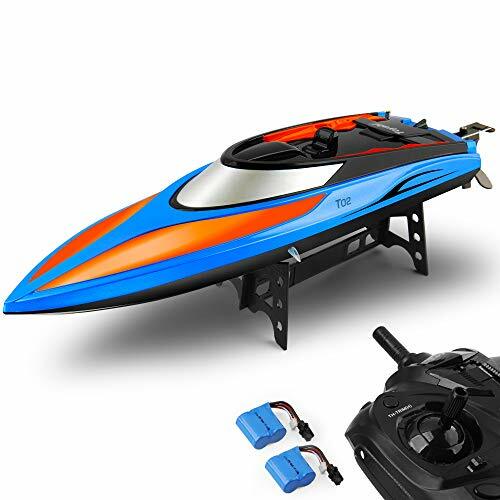 The Top Race Remote Control Boat is an excellent choice for younger kids who have never played with these kinds of toys before. This is because it has a speed of 3 mph which is easier for little kids to handle. We also liked how the remote control is super easy for kids to use. This makes it easier for them to learn how to properly use the controls and have fun. It can be used in pools or even the bath tub. Children are able to use the controls to make the boat go forwards, backwards, and in any other direction they like. They have a blast playing with it for hours on end. 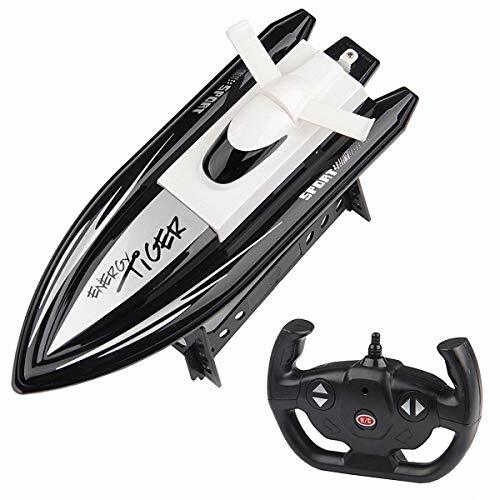 The 3 mph top speed and easy controls ensure that younger kids are able to play with this RC boat easily. 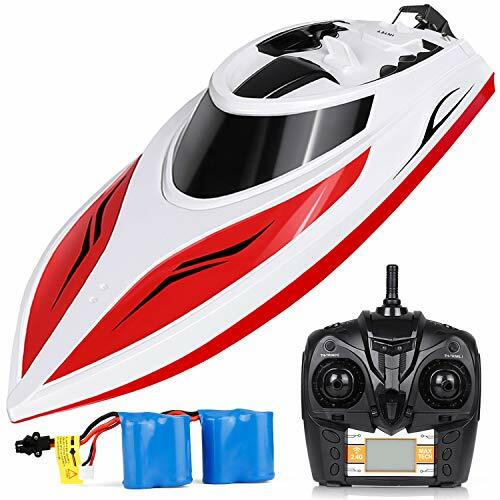 This Mioshor Remote Control Boat features and LCD display that provides you with the voltage to let you know when it’s running low. Children are able to use the remote to keep control over the boat while being up to 150 meters away. There is a throttle switch function that includes 2 modes for kids to use. This provides children with more control over their boat toy. We also liked how the motor has a water cooling feature which works to prevent overheating and keep the toy durable. In addition to this, there’s an anti-tilt design available which prevents the boat from tipping over. The high-quality ABS plastic materials also mean that this one will last your kids for a while. 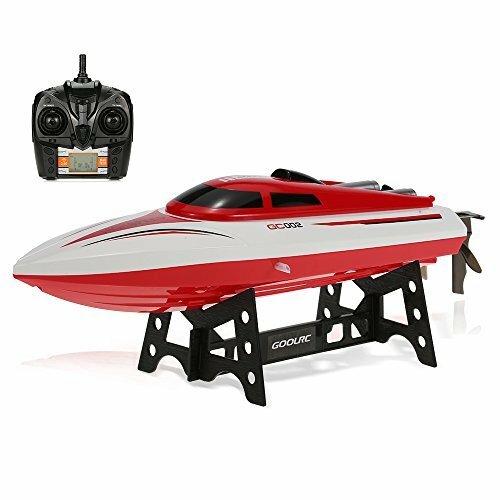 This is a durable RC boat that doesn’t capsize and can last your child for years of play due to the ABS materials and water-cooled motor. 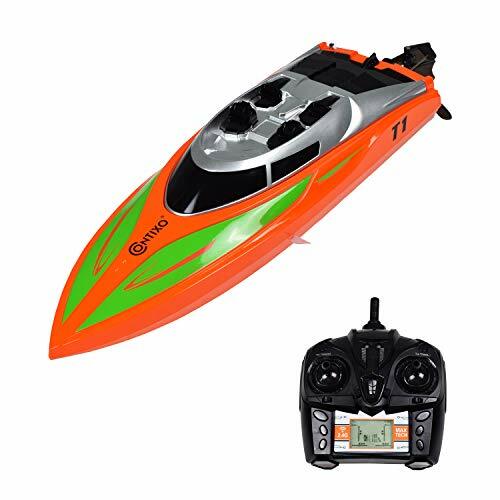 This GoolRC GC002 Remote Control Boat is able to travel at a top speed of up to 15 mph. 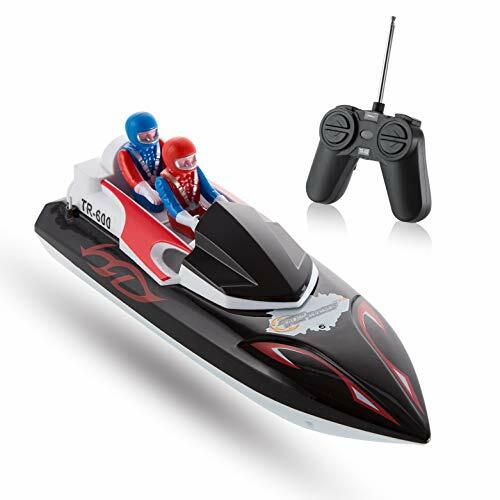 Children have a blast playing with these high speeds and being able to control the boat with the remote while being up to 150 meters away. The remote has a 4 channel design that lets kids move the boat backwards, forwards, left, and right. They can also make sharp turns without the boat tipping over. This is a result of the self-righting responsive V hull design that prevents it from capsizing. In addition to this, the control has a 2.4Ghz frequency which lets kids race multiple boats at the same time. The motor has a water cooling feature that prevents any overheating and ensures that toy remains durable. With ABS plastic materials, you can be sure that this one will last your child for a while. Kids have a blast playing with their friends and racing their boats together due to the 2.4Ghz frequency. It can be an excellent way for them to improve their social skills. 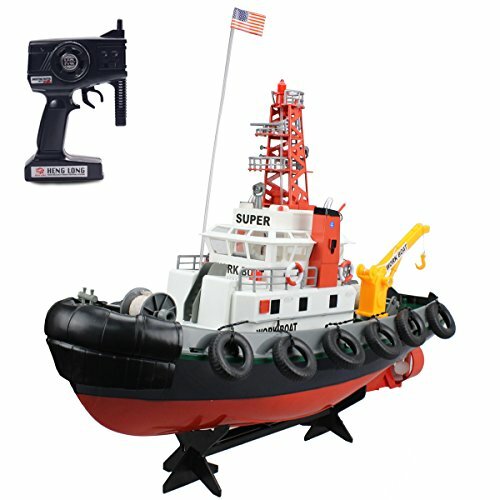 The Fistone RC Seaport Tugboat comes with a responsive remote that lets kids move the boat in all directions with ease. This controller has 2.4G technology which means you can get multiple boats out at the same time. As a result, it can make for some exciting group play with others to boost your child’s social skills. We liked how the battery can be easily recharged as a result of the USB input that’s available. The boat also turns on automatically when it’s in the water and turns itself off when it’s out of the water. This is an excellent safety precaution that prevents any electric shocks in the case that you forget to turn it off. 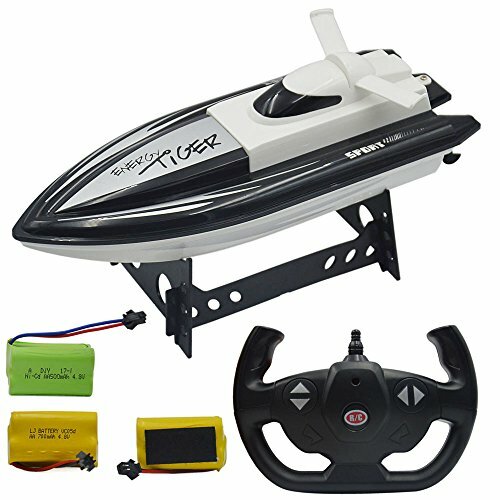 This is an excellent RC boat that lets kids race multiple boats at the same time to have a blast. Parents have been liking how effortless it is to recharge this one too. 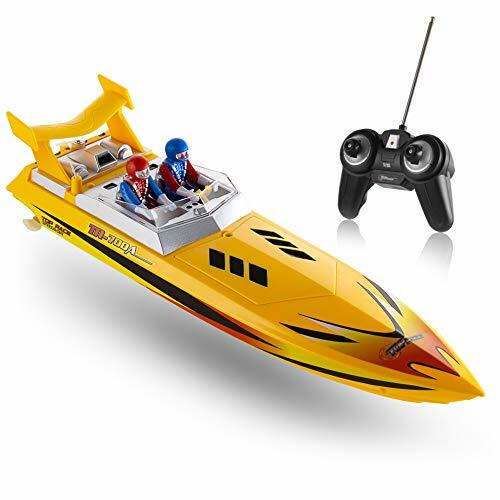 The Haktoys HAK606 Futuristic RC Boat has an excellent water cooling system that prevents the motor from overheating to ensure maximum durability. We were also impressed with how agile this boat can move in the water. This is a result of the high-torque steering function. Kids are able to make sharp turns while traveling at high speeds without the boat capsizing. The anti-flip design is a major factor in stopping the boat from capsizing. Kids can race this boat at speeds of up to 15 mph, which provides them with a lot of speed. The controller has a 2.4Ghz frequency which mean kids can race multiple boats at the same time. They can also be up to 500 feet away from the boat and still have total control. Children have been having a blast being able to race multiple boats at the same time at high speeds of 15 mph, without worrying about it capsizing. 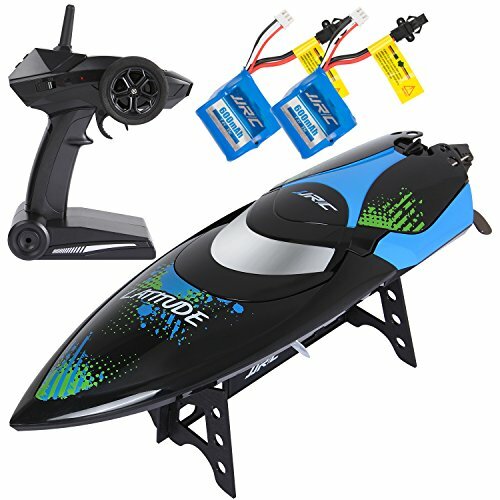 The Udric Venom Remote Control Electric Boat features a great USB input that makes charging a breeze. A low battery alarm is available which notifies you when the boat needs recharging. When it has been fully charged, kids are able to use it at a top speed of 15 mph. We liked how they’ve implemented a water-cooled motor as it works to prevent overheating. In addition to this, high-quality ABS plastic materials have been used to construct this one, which makes it very durable. There’s a self-righting feature that allows you to still use the boat in the water if it capsizes. Therefore, it’s excellent for beginners who may be struggling to prevent any capsizes. The self-righting feature means that beginners don’t have to worry if their boat capsizes as it’s able to correct itself and let you continue playing. 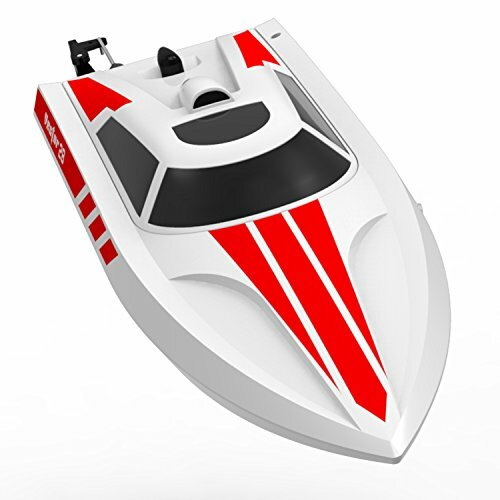 This Gizmovine RC High Speed Boat is able to travel at an impressive top speed of 20 mph. this is a lot of speed that ensures your child can have a blast racing it around on the water. The 2.4Ghz technology available means that multiple boats can be raced at the same time. Therefore, kids are given the chance to experience exciting group play, which is awesome for their social skills. They can also be standing up to 500 feet away from the boat and still have complete control. We liked how there’s a fantastic safety feature that only allows the propeller to turn on when it’s in the water. To ensure maximum durability, the motor has a water cooling feature which works effectively to prevent overheating. The self-righting design also prevents the boat from capsizing. Kids have a blast being able to race their friends with the high speeds of 20 mph. It’s a great way for them to have fun outdoors while developing their social skills. This Fast RC Boat is able to travel at a top speed of 18.6 mph, which allows kids to have a ton of fun racing it around. You can be up to 150 meters away from the boat and still be able to control it. We liked how it has a self-righting feature that allows the boat to correct its position by itself if it capsizes. This is a great feature for beginners who are still getting the hang of the controls. The 2.4Ghz technology in the controller enables multiple boats to be raced simultaneously. This provides kids with a great opportunity to play with others and develop their social skills. With high grade ABS plastics used to construct the boat, you can be sure that it will remain durable for a while. We liked how this one allows multiple boats to be raced at the same time as it makes the playing experience more exciting for kids. It’s also excellent for improving their social skills. This Udric Remote Control Electric Boat is able to travel at speeds of up to 15 mph which is plenty to allow kids to have a ton of fun. We also liked how the remote has a 2.4Ghz frequency as it enables children to race multiple boats at the same time. The high-quality ABS plastics are strong and keep the boat durable. In addition to this, the motor has a water cooling feature which keeps it durable. This boat also has an anti-tilt hull which is effective at preventing it from capsizing. Therefore, it’s a great option for beginners. There’s a warning that lets you know when the toy is running low on battery. so, you’re able to bring it back towards you before it runs out of power. Children have a blast being able to race friends at speeds of up to 15 mph. It’s excellent for boosting their social skills and encouraging outdoor play. This Racing Boat RC Vector is able to travel at a top speed of 20 mph which lets children race it around and have a lot of fun. The motor has an excellent water cooling system that works to prevent overhearing and keep the boat durable. As a result of the 2.4Ghz technology that’s available, over 20 boats can be raced at the same time! This enables kids to play in large groups of friends and compete, which is awesome for their social skills. There’s a USB input which makes recharging the battery a breeze. It takes 3 hours to fully charge, which provides kids with 20 minutes of continuous play. We liked how this one has an impressive speed of 20 mph and how more than 20 people can race their boats simultaneously. It’s a great opportunity for kids to develop their social skills. 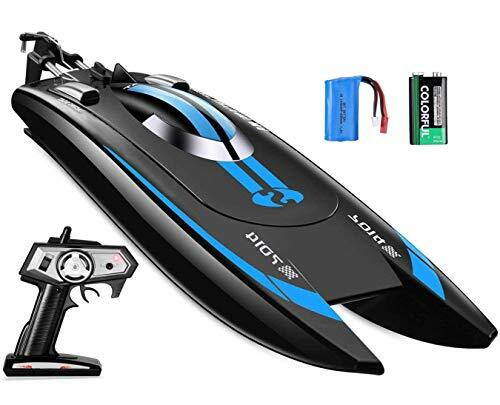 This SGOTA RC Boat is able to reach a maximum speed of 18.6 mph, which is plenty for kids to have a ton of fun with. You can also be up to 150 meters away from the toy and still be able to have total control over it. We liked how it has a self-righting design as it ensures that the boat corrects itself if it ever capsizes. This encourages children to take more risks when playing to try and pull off sharper turns. The 2.4Ghz controller means that multiple boats can be raced at the same time. Therefore, kids are given the chance to play in groups to race their boats together, which is great for their social skills. We liked how kids can try out trickier maneuvers with this one because it doesn’t matter if the boat capsizes as it’s able to correct itself. The POCO DIVO Deep-V Pool Racer is able to travel at a stop speed of 20 mph, which lets kids have an absolute blast. Furthermore, the 2.4Ghz technology that’s available means that multiple boats can be raced at the same time. This provides kids with a great opportunity to develop their social skills while having fun and playing in groups. We liked how there’s also a low battery alarm that notifies you when the battery is running low. There’s a USB input which makes is effortless to recharge. We also liked how there’s a rubber sealing hull cover to ensure that water can’t penetrate to keep the boat durable. The 20 mph top speed and ability to race multiple boats makes this boat a lot of fun for kids to play with in groups to develop their social skills. 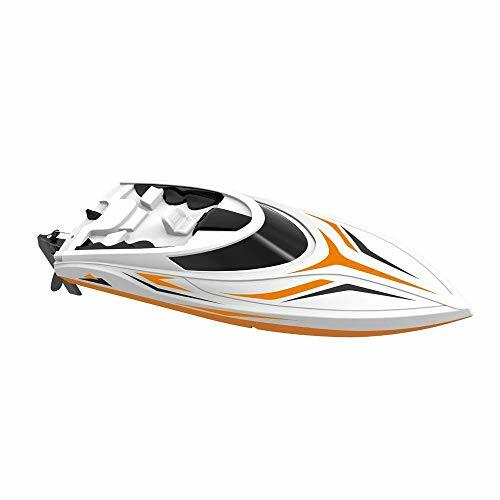 The Contixo T1 RC Racing Sport Boat provides kids with a top speed of 20 mph which lets them have an absolute blast racing it on the water. We liked how it includes a capsize recovery feature as it’s super handy for beginners. If the boat capsizes, all you need to do is use the remote to flip the boat back over. This is an awesome feature that lets beginners get a grasp of the controls. There’s a double-hatch seal design included too. This works effectively to keep any water from getting inside of the boat. As a result, you can feel more confident in knowing that it will last your child for a while. The capsize recovery ensures that you can continue using the boat if it ever flips over, which is great for beginners. 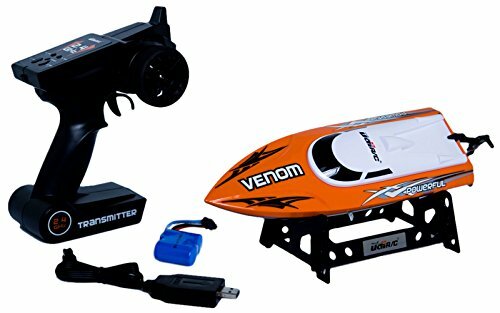 This Blomiky F3 Remote Control High Speed Boat features a 2.4Ghz remote that lets 10 different boats be raced at the same time. Therefore, it’s an awesome option for enabling kids to play in groups and race their friends, while also developing their social skills. The dual motor design that’s available means that kids are able to play with this boat at high speeds. This make it more exciting to play with as it challenges kids to focus and stay in control while competing against others. Charging this RC toy is super easy. It takes around 2 hours for the boat to fully charge. This provides kids with around 20-30 minutes of continuous play which is plenty. The powerful motors that are available with this one make it a lot of fun for kids to play with and race with other people. Their social skills can be improved too. 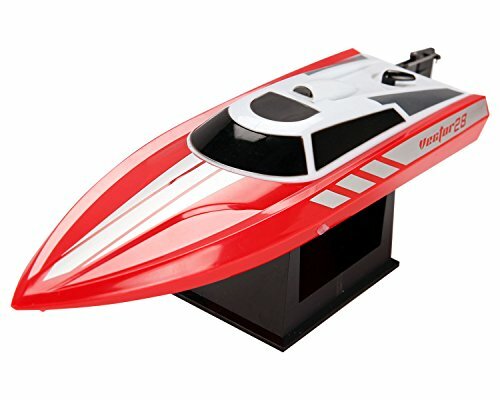 This ANTAPRCIS Remote Control Speed Boat is able to travel at speeds of up to 20 mph. Kids have been having a blast with this amount of speed, especially since they can race it against other boats. This is a result of the 2.4Ghz technology that allows multiple boats to be raced at the same time. As a result, kids are able to play in groups and develop their social skills. We also liked how the controller is super responsive and enables kids to perform some awesome flips and sharp turns. The motor has a water cooling system which works effectively to ensure that the boat is able to remain durable. It also has an excellent capsizing recovery feature. This works effectively to correct the boat’s position after it has flipped, which is handy for beginners. We liked how kids are able to race other boats with speeds of up to 20 mph. It’s a lot of fun and can help your child to improve their social skills. Now that you’ve had the opportunity to read through the different RC boats that are currently available, you can be sure to find the one that’s perfect for your child. If you’re still not feeling 100% confident on your choices, you’ll want to check out this buying guide section below. After reading through all of the different options below, you will have seen that there are various kinds available. To learn more about the different RC boats and what makes them distinguishable from one another, have a read of this section. Speed boats are the ones that have the sleekest design as well as a flexible structure. This is because it enables them to travel at faster speeds and cruise across the water. The sail boats tend to have more attention to detail in the design. They’re slower compared to some of the other options as the design of the sails aren’t made for higher speeds. Jet boats are a great option for kids who may have already had some experience with racing RC boats. This is because they’re usually able to travel at faster speeds, which can be trickier to handle. The tug boat that we’ve reviewed in this post has been constructed with fantastic attention to detail. This provides the boat with a more realistic look which is exciting for kids to play with and control on the water. 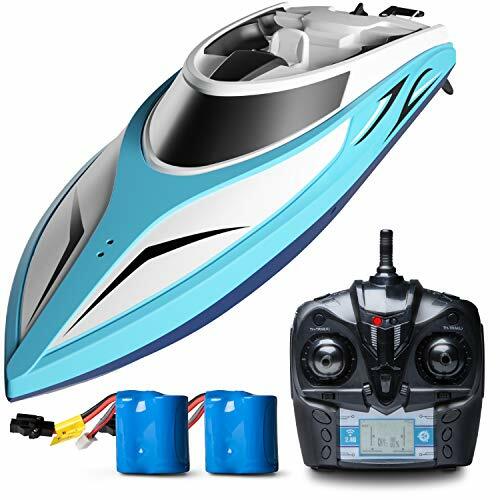 When it comes to the mini RC boats that are available, they have lower speeds due to the smaller motors and amount of power that they can produce. Their charging and run times are also significantly shorter. However, this may be just what you need to keep your little one engaged for shorter periods of time. They’re a great way to introduce kids to learning how to use RC boat toys. Fishing boats can be a lot of fun for kids to play with because they often come with mini accessory items. Kids have a blast using these items and pretending that they’re taking the boat out to fish. It’s awesome for boosting their creative thinking skills. The remote control boats that are powered by gas are recommend more so for older teenagers and adults. This is because they’re able to travel at even higher speeds compared to the battery powered ones, which can be a little overwhelming for kids. These ones are best for introducing your kids to RC boats before moving onto the more high powered ones. So, that brings our review of the top remote control boats for kids to a close. Be sure to read through all of the main features, pros, cons, age recommendations and what makes each one stand out. The buying guide section also included a range of useful details that will help you feel confident about your final decision. Hopefully, everything you need to know about finding the best RC boat for your kids can be found in this post!